Happy April Fools’ Day! This was the joke post put out by the DPOC team. Though none of the following post is true (Comic Sans is going nowhere so far as we know), it is important to think about the preservation of font files. Ever notice that if a certain font file is not installed in your computer, the certain files can look completely different? Suddenly specialised font files become an important part of the digital file (maintaining its original look and feel) and preserving it becomes important. Just something to think about. We were deeply saddened by today’s news that Microsoft Office products will in the future stop supporting the iconic Comic Sans font. The decision comes as a direct reaction to the slow decline in popularity and uptake from the Microsoft user community. The font became a staple in the mid 1990’s, but has seen a back-lash, particularly from the media industry, over the last few years. Repeated ridicule from leading public relation agencies and graphic designers has inevitably led to the drastic response from Microsoft. ‘Ban Comic Sans’, a fanatic society of typographic purists, have after an extensive smear campaign fought over a 15-year period finally won their case. “Clearly, Comic Sans as a voice conveys silliness, childish naiveté, irreverence, and is far too casual[…]”, they comment gleefully following the news from Microsoft Head Office. As preservation professionals and historians, we feel that it is our duty to speak up for all the other lovers of the font. Fans who have for years been shamed into silence by the widespread acceptance of these fanatical views. 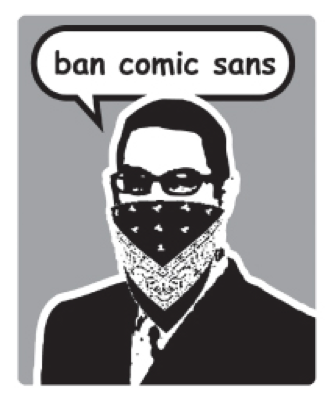 The digital preservation of Comic Sans is not only about safeguarding 20 years of cultural history, but it is also about doing the right thing for our children and grandchildren. As a small tribute, and as a show of our appreciation www.dpoc.ac.uk, will from now on only blog in Comic Sans. We refuse to say RIP to the font – we say it is time to fight the good fight. If you have an anecdote about a time you enjoyed Comic Sans – please comment below and show your support. Perhaps we can make a difference together. This entry was posted in justforfun, project update by Sarah. Bookmark the permalink.